EPOCHAL is Japan’s sole brand-name apparel maker that specializes in “epoch-making” arrays of apparel products capable of shielding your skin from everyday, hamful impacts of ultraviolet that stems from sun’s rays. In addition to specially woven textiles containing anti-ultraviolet-capable titanium-oxide particles, which have been developed by one of Japan’s blue-chip textile manufacturers, we, EPOCHAL, have also been making use of a range of skin-friendly materials. We are a company that was founded and has since been run only by women who all have experiences in raising children. Utilizing high-performance fabrics for every one of our products, we have continuously been addressing the task of carving out new designs in response to all kinds of needs of people–ranging from babies to grown-ups–who are earnest about protecting themselves from adverse influence from ultraviolet. In Japan, EPOCHAL apparel products have been attracting much attention from not only healthy individuals but also people with such disorders as atopic dermatitis, photosensitivity and XP (xeroderma pigmentosum). With a view to serving as a field of “preventive medicine,” EPOCHAL products are designed to be conducive to fast-acting prevention of declines in immune strength, as well as keeping your skin beautiful now and in the future. Articles of EPOCHAL brand of wear have long been supported and used regularly by people who have high levels of awareness of the preciousness of health. The kinds of our products have currently numbered about 500, ranging widely from items for babies, kids and child-rearing mothers, along with men with active lifestyles, with due attention being paid to their diverse facets of life. 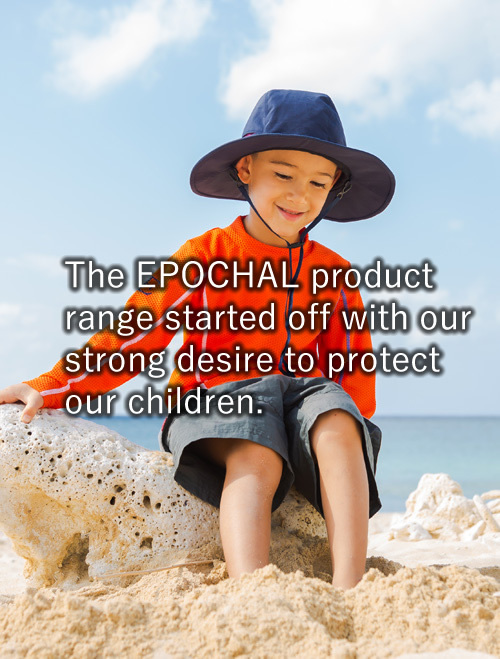 EPOCHAL products have come with a creative endeavor for making our customers able to choose ones well suited to what you feel desirable for the purposes of your activities, including items for school life and outerwear well-matched to playing sports, all with the aim of securing skin health in a broad and comprehensive manner. Marking the 17th year in 2019 since its launching, EPOCHAL has been continuing to evolve as a comprehensive, highly valued brand manufacturer that persists over generations with a full-fledged lineup of products for men having been just added to our range of goods.